Pan Flute Kazoo and Bottle Cap Clacker | Pi'ikea St.
It’s great to fill your days with music. Kids are able to move their bodies and be creative at the same time. So, let’s put some instruments together for your next jam session. Cut one of your toilet paper tubes so that it measures 3 1/8” and another 2 1/8”. 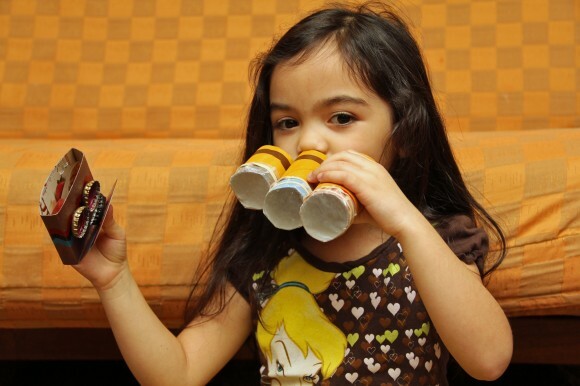 Decorate the tubes with paint or whatever your child is most comfortable using. Allow to dry. Cut 3 squares of wax papers slightly larger than the opening of the tubes. Wrap one square around a tube and secure with a rubber band. Do this with the 2 other tubes. Line up the tubes from tallest to shortest and staple together. 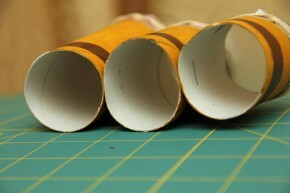 Use a 1/8” hole punch to make one hole in each tube. To play, hum or sing into each tube. Cut a 6” x 8 ½” rectangle from a cereal box. Then cut the left bottom corner out which measures 3” x 3”. 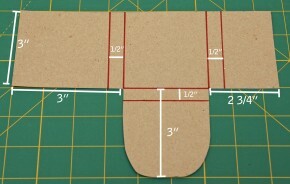 Cut the right bottom corner which measures 3” x 2 ¾”. Round the corners of the remaining bottom portion. It should look like this: The red lines indicate where you’ll need to make folds. The top half will get folded toward the print of the cardboard. And the bottom half will get folded toward the solid part of the cardboard. Now you can decorate the non-printed side of the cardboard. Allow to dry. Glue your bottle caps onto the middle portions of the cardboard and let it dry. Staple the top flaps together but make sure the opening is wide enough to fit over your hand. To play, fit the opening over your four fingers and use your thumbs to clap the caps together. 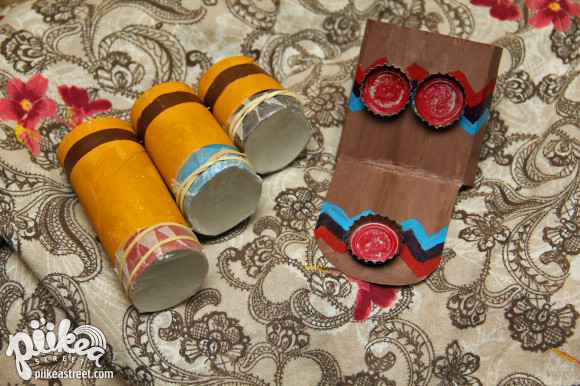 Now you can start your own one-man band or make instruments for everyone in the family to join in the fun.